In the midst of our preparation for Street Style Chi’s For The Sake of Fashion fashion show (in Cortelyou Commons on DePaul’s Lincoln Park Campus on Saturday, March 9th-doors open @ 7pm), I’ve run into a few outfits way too fashionable not to share with all of you! First picture: I love this outfit! I think it’s amazing for winter going in to spring. This preppy dress is SO amazing. When I first saw it, I thought it was a cute shirt. When I saw her turn around and realized it was a dress, I just knew I had to snap a picture of it. The leather boots are the perfect finishing touch to the dress and really polish it off. 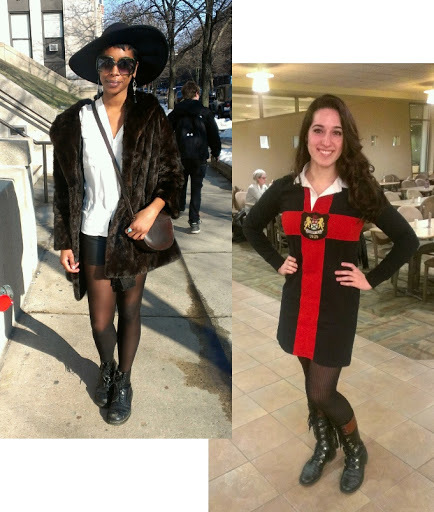 Second picture: I think this is one of the best outfits I’ve ever seen on campus! From the boots to the wide brimmed hat, this outfit is perfection. The fur coat is so appropriate for winter, but the wide-brimmed hat and leather skirt are perfect for spring or a warmer winter day (like the nice day that this picture was taken on). This outfit still blows my mind whenever I look at it. She looks like she should have paparazzi following her everywhere. Perfect outfit. I hope that I will get to see YOUR amazing outfits on Saturday at the For The Sake of Fashion fashion show! It’s really going to be an amazing event and I can’t wait to see everyone!